The U.S. Fish and Wildlife Service has proposed to list the Black Warrior waterdog â€” a rare aquatic salamander found only in the Black Warrior River basin in Alabama â€” as an endangered species under the Endangered Species Act. The agency has also proposed designating nearly 670 miles of river as critical habitat for the waterdog. Because of the severity and immediacy of threats currently impacting the species, both of these actions are key to fully protecting it under the Endangered Species Act. Much of the waterdog’s range is impacted by surface mining operations, some spanning thousands of acres. Inclusion on the federal endangered species list will not only protect the waterdog, it will also provide a new tool to communities seeking to stop the destruction of North Alabama’s mountains for coal. These mountains are the tail end of the Appalachian Mountain range, and they feed beautiful headwater streams that are rich with aquatic life â€” making Alabama the top state in the U.S. for freshwater aquatic biodiversity. To take action, please use BOTH of the links below and copy and paste the sample comment provided, or write your own. sample comment: The Black Warrior waterdog deserves to be listed as an endangered species. Known to be a rare species for over thirty years, it is time for this salamander to achieve full protections under the Endangered Species Act. 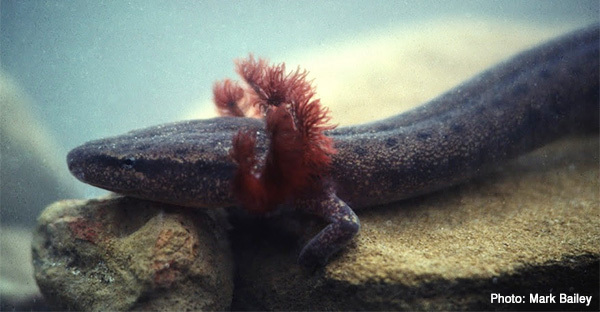 Since the Black Warrior waterdog is only found within Alabamaâ€™s Black Warrior River basin, it is a unique natural resource worth protecting from pollution, harmful coal mining activities, and habitat degradation. Thank you for proposing to list the Black Warrior waterdog as endangered, and I trust the Fish and Wildlife Service will do so. sample comment: The Black Warrior waterdog deserves to have critical habitat designated, as proposed. It is time for this rare salamander to have its habitat protected under the Endangered Species Act. Since the Black Warrior waterdog is only found within Alabamaâ€™s Black Warrior River basin, it is critical to protect its habitat from pollution, harmful coal mining activities, and resulting degradation. Thank you for proposing to designate nearly 670 river miles as critical habitat for the Black Warrior waterdog, and I trust the Fish and Wildlife Service will do so.